Hey everyone! It's that time of the year, Spring is in the air, and playoff hockey is just mere days away! Jeff and Cassy, who make up the WBS portion of the Staff at PI, have teamed up to dish out their Award Winners for the AHL Penguins. 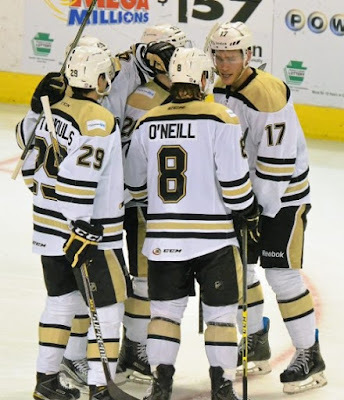 It's been an up and down year for the Penguins, but with just a few games remaining, they are right in the hunt for the Atlantic Division Title, and have a magic number of just 2 to clinch their 14th straight Calder Cup Playoff appearance. Jeff: I'm going to have to say Dominik Simon. The Czech rookie has adapted extremely well to the North American game. Dom doesn't love contact, but his skating ability gives him the option to avoid it most of the time. The sneakiest wrister I've seen here since Beau Bennett, and frankly it's probably better. He's got 22G, and 22A for 44 points in 64 games. He's been consistent for a rookie as well, I don't remember him going through a slump of any kind. The Swedes, Andersen and Sundqvist have been very good as well, but Simon was an All-Star and has stood out for sure. Cassy: Dominik Simon. Not only is this his first year in the AHL, but it's his first year playing hockey in North America. Different play style, different sized rinks - and Oskar Sundqvist has told me before that the size of the rink is a huge difference maker when attempting to adapt to North American hockey. Considering this, Dominik Simon - a 5th round Pittsburgh draft pick in 2015 - has 22 goals for 44 points in 64 games, averaging 0.68 points per game. Very admirable for a newcomer in his rookie year. Cassy: Derek Army. I say this because of the role he played, and how well he played it. First off, when he was called up, Army was in the bottom six and played as a role-player, but it quickly evolved into a steady top-six role and definitely was not a reliability. He only scored 2 goals for 4 points in the 14 games he was up, but regardless, he impressed me. I wouldn't be surprised to see him on the main roster next year. He even managed to get first star honors in a game against the Utica Comets. Jeff: Sahir Gill. Gill was used as a call-up option from Wheeling last year as well, but he just couldn't quite find his stride here in the AHL. This year, after nearly making the roster out of camp, he has come up and knocked the door down. Showing great versatility, and the ability to play anywhere in the lineup, made him extremely valuable when the Pittsburgh injury curse struck again. He found his way onto the score sheet quite a bit with 5G and 9A for 14 points in just 21 games. He's on his way back from a groin surgery that nearly put him out for the year, but he is due back in a week or so and could play a major role in this team's hunt for the cup. Jeff: Will O'Neill. I had quite the difficult time deciding which way to go on this one. Steve Oleksy has been an absolute rock on the back end for this team. He always makes the heads up play, and almost never gets caught out of position. Not to mention he always has his teammates backs. Without Oleksy this team isn't competing for a division title. With that said, when Pittsburgh called up Derrick Pouliot, the Baby Pens needed someone to step up and fill in on the Power Play and provide offense from the back end. Will O'Neill did better than just fill in, he excelled. O'Neill has been so good transitioning out of his own zone, always making that tape to tape pass to get the offense started. He has been even better on the PP, everything the Pens do with the man advantage runs right through him. Outstanding at finding shot lanes through traffic and can bomb them when he has to. Ranks in the top 3 in AHL Defenseman scoring. 8G, 37A, for 45 points. One surprising thing about Will is that he plays with a nasty edge, touch his goalie, and may god help you. Cassy: Derrick Pouliot. This may be an odd choice, but I look at what he was doing before he was called up to Pittsburgh (seemingly for good). In 37 games, Pouliot was a +15 and had 6 goals for 23 points. This would mean Pouliot, in only his second pro year of hockey, would be on pace for about 44 points and 11 goals. Doesn't seem like a sophomore slump, does it? And only at the ripe age of 21-22, Pouliot was relied on to play in all situations - the first pairing in 5v5, the first powerplay unit, and at times the first penalty killing unit, if not the second penalty killing unit. At such a young age, Derrick Pouliot was able to take on the workload, and excelled with it. He is my defenseman of the year. Not to mention he was an AHL All-Star (missed the weekend due to call-up). Cassy: It's hard not to go with Scott Wilson. Sure, he didn't spend much time there, but you need to think of the times he WAS there, and how he contributed. In the 34 games he played, Wilson scored 22 times for 36 points. He, for the majority of his playing time, lead the AHL in goals scored, once succumbing to Providence's Frank Vatrano but soon taking back the lead. This puts Wilson on pace for 45 goals and 74 points in a 70 game season. For this reason, I have Wilson as my forward of the year. Jeff: Maybe this pick will surprise some people, but my pick is Kael Mouillierat. "Rat"as they call him here in Wilkes/Barre, has been a mainstay on the team's top line and has produced despite the constant changing of his line mates. He also occasionally plays on the PK, and always plays in front of the net on the number one PP unit. A great mixture of grit and skill make Kael a very good two way player. Let's not forget he may have scored the goal of the year in the AHL with his lacrosse style goal from behind the Hershey net. Much like O'Neill he plays the game with a chip on his shoulder and loves those post whistle scrums, he thrives getting under the opponent's skin. With an impressive stat line of 17G and 27A for 44 points, Kael's production and leadership have made him essential to the team's success. Jeff: Carter Rowney. This one was a bit more cut and dry. Rowney has transformed himself from a 3rd line grinder into an elite offensive player at the AHL level. Since his first call up from Wheeling a few years back, Carter has gotten better on a day by day basis. Fans here in WBS talk about his growth all of the time. He is the perfect example of a developing prospect. He still kills penalties, only now he also plays on the top PP unit. He continues to win faceoffs at an unbelievable rate and garnered his first NHL contract a few weeks ago. He was named the AHL's player of the month for March making him the first Penguin to claim the honor since Chris Conner in 2010. Last season he set a career high with 31 points in 63 games. So far this year he has 21G and 31A for 51 points in 68 games. He took his game to the next level when the team needed him most after all of the call ups to Pittsburgh happened, and has not let up since. Cassy: Essentially what Jeff said. Carter Rowney. Cassy: Tristan Jarry. Just like Dominik Simon, this is Tristan Jarry's first season of pro hockey as he came from the WHL's Edmonton Oil Kings. He was on the Wilkes-Barre/Scranton Penguins last year, but played third fiddle to Matt Murray and Jeff Zatkoff, never starting or playing a game. This year, he went from Matt Murray's backup (and what a backup he was), to starter, to getting 2014-15 Cory Schneider-esque playing time. Head coach Clark Donatelli relies on Jarry for almost every game nowadays, and he's usually very good in his appearances, as he's only been pulled once the entire season. The team has been slumping lately and this has affected his stats (adjusted save percentage doesn't exist in the AHL as shots aren't yet charted at that level), but make no mistake, Jarry is a great goaltender. Jeff: Jean-Sebastien Dea. I was leaning a few different ways on this one but ultimately couldn't find a better candidate than J.S. As a rookie last year, Dea displayed a wicked shot and showed just how much he loves to score goals, as he can "celly" with the best of them. he is well on his way to a 20 goal campaign, he needs just one more in 6 games. Add in 16 helpers and his new found physicality and it's been quite a sophomore season for J.S. A Power Play specialist in a big way, and has a knack for scoring timely goals, including a tap in game tying goal to cap off a 3 goal 3rd period comeback against the rival Phantoms. Oskar Sundqvist, Nic Andersen, and Josh Archibald deserve a mention for this category. Cassy: TK. Let Jeff explain here. Jeff: Tom Kostopoulos. As crazy as it may sound, the oldest player on the team and Captain, has been the rock for this team all year. This isn't a novelty, it's not about his history with this organization, its about this year. He has played inspirational hockey all year long. He has 19 goals including 10 in the PP which ranks top 5 in the league, and he is 3rd on the current roster in total scoring. He is actually 2nd behind only Carter Rowney of the players who have been here all season. Perhaps the greatest example of the leader he has been comes back in early November. After a game against Syracuse TK was ruled out for a few weeks with a lower body injury after blocking a shot with his foot. Clearly he broke a bone in his foot, and later that was confirmed by media outlets. The next night the Captain skated in the pregame warmup. He would in fact play, score a goal, and oh yeah, pick up a fighting major defending a fallen teammate who was illegally boarded. Kostopoulos has without a doubt been the most influential player in WBS history, holding almost every team record in the book, but the work he has put in thus far in 2016 may be his finest yet. He has stated himself how much he wants to bring the Calder Cup to WBS, and if it is to be, Tom Kostopoulos will have his fairy-tale ending. Thanks for reading! Let's hear your feedback fans, who are your winners?